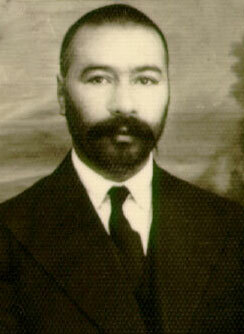 While the majority of mystics abandoned the world to retreat to a life of contemplation, Ostad Elahi did the exact opposite: he renounced a predetermined life of seclusion marked by ascetic practice and meditation to experiment with a new approach to spirituality, one whose goal was constant attention to the Source while leading a normal life in the midst of society. Thus, when he assumed a governmental post in 1930, not only did he part from a reclusive lifestyle, but he also transcended all of the notions of traditional mysticism. This new environment would provide him with an opportunity to expand his system of thought and test its ethical principles. In retrospect, the whole of the twelve years of asceticism that I endured prior to joining government service had less spiritual value than just one year spent in the office. 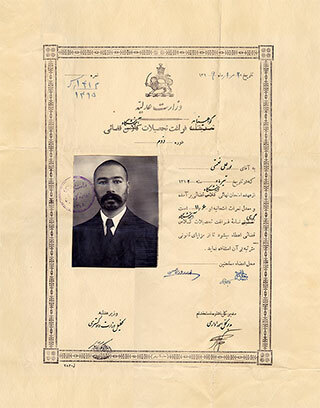 At the time of Ostad Elahi’s birth in 1895, Persia had been ruled by the Qadjar dynasty for almost a century. With the fall of the Qadjars some 30 years later, Reza Khan assumed the throne. Determined to rapidly modernize the country, he reorganized the government on the basis of a western model and promulgated new civil and criminal codes. Naturally, it would take some time before these sweeping reforms had any impact on the customs and rites of a society that was still under the influence of the Qadjar rulers. Thus, when Ostad Elahi began his government service the country still retained a more or less feudal system in which powerful families continued to play the role of lords. Small towns were under the sway of wealthy merchants and large landowners, who actively wielded their considerable influence to exert control over the government and judiciary. When I presided over the courts in Kerman, there were two prominent and highly influential families, the ‘D’s and the ‘Z’s. The ‘D’s provoked the ‘Z’s by setting fire to one of their orchards, and a complaint was filed with the court. The ‘D’s paid a 24,000-toman bribe to the examining magistrate to clear them of any wrongdoing, who in turn dismissed the complaint on the basis of ‘insufficient evidence.’ The ‘Zs’ appealed the ruling and the case was brought before me. Since the evidence supporting their appeal was unequivocal, I annulled the magistrate’s ruling and reopened the case. On the day of the hearing, so many members from both families were present that my deputies were afraid to assume responsibility for the case; I told them I would personally handle the matter. Since it was not a suitable time to render my ruling, I postponed the announcement of the verdict until the following day. That night a man by the name of Hadji ‘S,’ who was both a dervish and a panegyrist, came to see me and said: ‘The ‘D’s have sent me to tell you that they paid the examining magistrate 24,000 tomans and are willing to pay your Honor twice that amount to uphold the prior ruling; otherwise, they not only have well-placed connections in the Ministry of Justice, but they can also invoke their local means.’ I replied: ‘Tell them that I am not afraid of them or the Ministry, and they can do whatever they please—I will render my own verdict.’ After Hadji ‘S’ left, several others came on behalf of the ‘Z’s and said: ‘We know what you told the ‘D’s. We will pay you even more if you render a just verdict.’ I sent them away as well. The police, who were worried about this situation, had posted guards around my house the entire night without my knowledge. The next day I went to the courthouse, where a large crowd had gathered from both sides. I cast my verdict and reversed the magistrate’s ruling, and they were not able to do a thing about it. They did succeed in embarrassing the magistrate, however, by demanding that he repay their bribe. I summoned and severely reprimanded him. It was within such an environment that Ostad Elahi commenced his judicial duties in 1934, and remained under these difficult conditions until his retirement in 1957. Throughout his professional career, he was forced to confront pressure from these influential families or from the recommendations of a Ministry of Justice that was directly under their influence. Because his integrity prevented him from being complicit in illegal acts or unethical verdicts, he was repeatedly transferred at the request of these families. These recurring transfers were naturally quite difficult and forced Ostad Elahi to either part with his family on many occasions or to take them with him to remote and inhospitable regions. When I was the Public Prosecutor of Khorramabad, there were two brothers who were wealthy merchants. When one of them died and was survived by a wife and five children (four daughters and a son), the other brother took the two oldest daughters as brides for his own sons and married the widow. The remaining two daughters and one son, who were minors, were thus left without protection. Whenever I was transferred to a new post, my first order of business was to tend to any cases involving minors. In reviewing this particular matter, I noticed that although my predecessors had also requested the file, no action had ever been taken. I reactivated the case and summoned the merchant, who was quite influential. When he appeared before me, he began using such flattering phrases as ‘I am your humble servant’ and ‘I am at your service.’ After going to great lengths to show his warmth and friendliness, he said: ‘Your Honor, there is no need for any of this; there is nothing wrong with my guardianship.’ I replied: ‘It’s been 12 years since you provided an accounting for the minors under your guardianship.’ ‘But sir, there is no need for an accounting,’ he said, ‘for my brother’s widow is currently my wife, two of his daughters are my daughters-in-law, and the other children are like my own. But I will certainly comply with your order and bring you an accounting tomorrow.’ He came back the following day with a large envelope full of cash. I asked: ‘What’s this?’ He lowered his head and replied: ‘Your Honor, this is merely an unworthy gift, and there is no one here but you and me.’ ‘You are mistaken,’ I said, ‘there is someone else here, and that is God.’ Then I realized why the case had remained dormant till now. As for the merchant, he used every means at his disposal—I even received a recommendation from the Ministry of Justice to drop the case—but I remained steadfast in demanding an accounting for the minors. Finally, I warned him that if he did not comply with my order and render an accounting within 24 hours, I would have him imprisoned. Once he realized there was no other alternative, he requested that we send a few officials to conduct an accounting. I sent four trustworthy clerks, and after a month of hard work they finally produced the records. The fortune the brother had amassed from the orphans’ inheritance was astronomical, and that was only what the clerks had managed to account for. I immediately revoked his guardianship and returned the properties to the minors. But God only knows how much of their inheritance he had already spent. In my opinion, an official who accepts a bribe to overlook an investigation commits a greater transgression than the solicitor of the bribe. In spite of these difficulties, Ostad Elahi persevered in government service for almost 30 years. He gradually rose through the ranks, from an Examining Magistrate in the District Courts to Head of the Public Prosecutor’s Office to Chief Judge of the Criminal Court of Appeals, the highest rank attainable in the judiciary. Later, in reflecting on this period of his life and the influence that his profession had on his spiritual path, he concluded that a single year spent in the judiciary striving to accomplish his duty and render justice for the sake of divine contentment had provided him with more spiritual experience than the 12 years of consecutive asceticism he had engaged in during his adolescence and youth. In both volumes of his oral teachings, Ostad recounts numerous anecdotes from his judicial career. In these sayings, Ostad relays how he came to enter the judiciary despite his own reluctance, the manner in which he executed his duties as a judge, the pressures he routinely confronted, and the basis for his early retirement. A careful examination of the detailed explanations that appear in these works reveals the tests that he arranged for himself in the midst of society to constantly challenge his system of thought.